I've been sticking them in my wallet, my notes for work, and even in between unused pages of my sketchbook. Transfixed eyes scan the ground everywhere I walk. I'll pick one up only to stop a few feet away, gasp, and pick up another and then another....people giving me strange looks along the way. It's become an obsession of sorts. That (crazy) inner voice telling me, "Take them, Dean. Take them!" --and I do. This year alone, I now have hundreds and hundreds of fall leaves pressed and saved. This morning's stash after walking to my neighborhood bank! Elm, oak, maple, it doesn't matter. I may choose a leaf for its intense color one day or its shape or size the next. It all depends on which leaves speak to me (crazy, remember?). They're all part of a super-duper, top-secret art project I'm working on. Okay, two art projects. Maybe three. As you can see I have an idea but it's not set in stone. I'm letting it evolve as it happens. But one project definitely involves paint....and possibly glitter. I'm always on the lookout for leaves, Leaves, LEAVES!! I love the time of year, here in NYC when the leaves cling to wet sidewalks on dreary-skied days. This is the picture of magical Falls here, and always brings me back to my first days as a Manhattanite back a LONG time ago. There certainly is an interesting variety in the coloration of the leaves. No two are alike. I'm sure whatever you come up will be well worth seeing, so keep us informed. Looking forward to how you express your leaves lookout. Oh, yay! You're doing art again! Good for you. See my email for something that might capture your eye. Nothing wrong with listening to a few leaves. Some of my best conversations have been with my deciduous friends. Woops! I wasn't going to let anyone know about that. 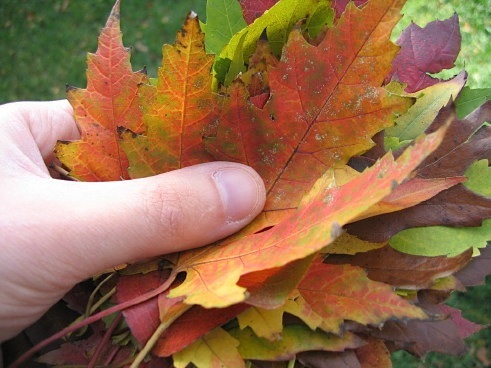 They are beautiful leaves Dean! NYC sounds lovely in the fall! I will keep drawing, Bob! Bad pun! Ha ha ha. I'm doing art again....or at least trying to! I think "fall madness" is an appropriate term here! I think my son has the same voices in his head, we have quite the collection of leaves at our house as well. They are gorgeous, as Steven says there is every color in the rainbow on these leaves. Nice blog with some wonderful posts. I came across your blog through JM's oeiras daily photo blog. I think it's great that your collecting leaves. If you think people look at you funny you should see the looks I get when I stop for a rock. Maybe it's a desert thing. Dean, thanks for your comments on my art, and good luck with your latest leaf projects! Great minds think alike, huh Carrie? Maybe I should start painting rocks next! If I had only known I could have donated a few hundred thousand leaves. Now I'll just have to rake them up. I spend some time yesterday out gathering leaves. I saw an exercise in an art book about painting on them so I picked some pretties and am pressing them. I have a stack already pressed and dried that my Mom got for me. I'm super curious about your top secret art project ~ So far this week I've made seven creations. No wonder my eyes are bugging out of my head! I'll give you a hint. Like you, I plan on painting the leaves as well! I always appreciate hearing from you two! I collect stones and leaves, so I totally get your obsession! Can't wait to see what you do! So I'm not the only crazy one here, huh? I saw tons of feathers Sunday at Jordan Lake and wondered what art you could create with them. I think they are considered an artifact so I did not take any. If you think you'd like some I'll call the park to see if I can gather some to mail to you. Why would feathers be considered an artifact? And I do have packs of feathers purchased from the arts-and-crafts store I work at. I've just never done anything with them…yet! In Boy Scouts we were told to never take anything from a national or state park that occurred there naturally, with the exception of fish if the park allowed fishing. The examples they gave included rocks and feathers. That was in Utah. It could be different in other states, and it could have changed since my scouting days.